The Australian Council for Educational Research (ACER) was commissioned by the Department of Education in Victoria to undertake an investigation of current best-practice approaches to ensuring consistency of teacher judgements against P-10 state-wide standards. The investigation encompassed national and international approaches that had been implemented or were under development. A key objective of the investigation was that the approaches identified should be based on current information, research and best practice, and that they should be supportive of the continued development of a learning and assessment culture in Victorian schools. 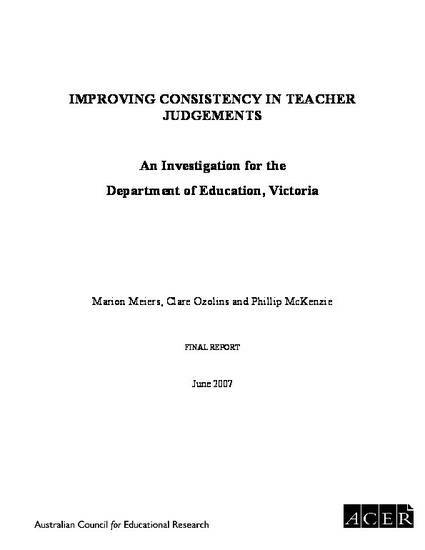 The report of the investigation was required to provide key baseline information that would guide further work on the development and implementation of a coherent approach linking to and building upon the Victorian Essential Learning Standards (VELS), progression points, continua, assessment maps and other policy, advice and support materials.